Milton Coronado paints a wall on 51st Street in the Back of The Yards neighborhood. The graffiti wall is a collaboration with other artists. When Chicago native Milton Coronado was struggling with family and personal problems as a child, he turned to art to cope. A son of Mexican immigrants, the 35-year-old Pilsen resident has come a long way since the days when he filled his notebooks with violent imagery, vivid representations of his inner turmoil. As a rebellious teen, his artistic flair took the form of graffiti. 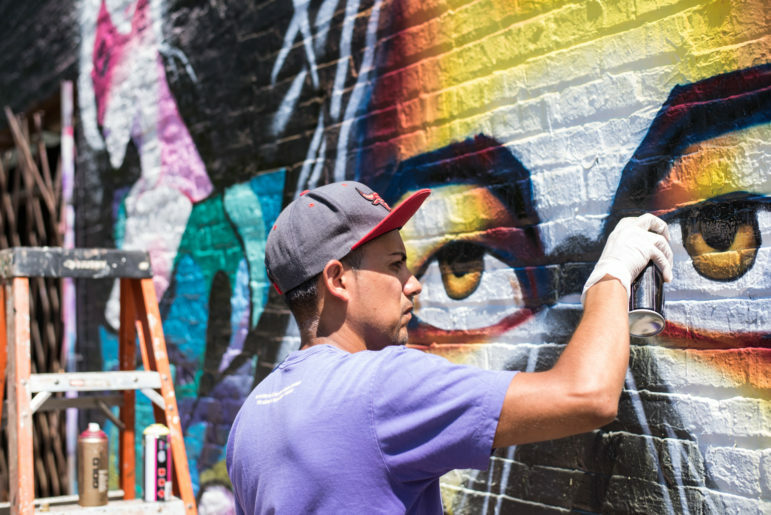 After graduating from the American Academy of Art in Chicago, he channeled his experiences with graffiti into starting Street Art Ministry, a program that aims to empower young people through art. The group painted its first mural in St. Louis in 2005. Street Art Ministry has no set membership. Artists are invited, often through word-of-mouth, to work on a mural, and they team up with children in the community. Coronado says public art can be a powerful tool for artists to convey important social messages and positively impact kids who, like him, struggle at a young age. The Reporter sat down with Coronado at Circle Urban Ministries in the West Side neighborhood of Austin—where Street Art Ministry created a mural in 2007—to discuss his past, using graffiti in positive ways and impacting others through art. When I was 5 my mom died, and that’s what drove me into drawing. When I went to sixth grade I started drawing as a way to connect with other people and make friends. In the eighth grade, I got to do the cover for our yearbook, which encouraged me to pursue drawing when I got to high school. I got accepted to the American Academy of Art and I decided I was going to be a big artist. But a year before I graduated, my father was killed. That’s what drove me to want to help others. Slowly after that, I started getting more and more speaking engagements, sharing my story in schools, churches, community centers. It started slowly developing until 2005 when I started Street Art Ministry, which uses art as a way to empower young people. He was shot by the same gang I used to hang with. My father was not affiliated with the gang. There was a suspect and there was a trial and the jury came out and it said that he was innocent. We didn’t find justification or any kind of truth or peace or answers to anything. Nobody knows what happened or why (the suspect) did it but we’re convinced he did it. It totally changed my life. It was (my father’s) death that really made me appreciate life. I asked myself so many questions that really targeted my heart and I decided to leave graffiti and just focus on painting. It was really his life that made me reflect on my own. How did the loss of your mother shape your art? I was five years old. I’m like, “Hold on. This was my mom, she’s sleeping”—I didn’t understand the concept of death yet. [Coronado’s father soon remarried]. There was always arguing between my stepmom and my father, and between me and my little brother (my stepmom’s son). I would fight him and she would punish me. That made me even more rebellious and even more angry. I went to paper and pencil. By the time I got to high school it was my time to rebel even harder, so that’s when I got involved with gangs and alcohol and weed. By my third year in high school I left all of that to get really deep into this graffiti world. Graffiti is often associated with vandalism. How does Street Art Ministry use graffiti in a positive way? What many people don’t understand is everybody who starts doing it, starts doing it illegally. It’s really hard for a young person to stop because of the adrenaline and the excitement of being chased and not getting caught. It’s just a really big, interesting high. I always thought that maybe we could use this as a way to give these kids a positive direction with it. Rather than just telling them to stop, how about we give them some wall space? A lot of these individuals are like, “Oh I don’t know how to draw, I don’t know how to paint,” but it really doesn’t matter. When you do a project like that, all you need is at least one artist who is humble enough to put his ego aside and teach these kids. Tell me about the mural you’re painting in the photographs accompanying this profile. I’m painting a character of Jesus with a breathing mask on. For a lot of street artists, it’s safer to use a breathing mask because of the type of (materials) you’re working with, safety for your lungs, etc. By painting Jesus as that, I’m trying to represent that he is just like me, that he is also a tagger or an aerosol artist or somebody that writes on walls, because he writes on people’s hearts. It’s an image I’ve wanted to do for a while and I had the opportunity to do it now. [Religious themes are] common for me because of my beliefs and passion but it’s not always religious. I like to incorporate the community into it. I try to do something that the community can relate with. In this area it’s very religious and very Catholic. For this painting, mothers walking by with their kids were stopping saying, “It’s el Christo, oh good thank you, we need that.” Some people were walking by and they were crossing themselves. What is the role of public art? I believe it’s necessary. Anybody who’s opened up their walls [to be painted]… they give [artists] the opportunity to not only grow in their art, but share a message to a community. A lot of these individuals have a message to share. Public art beautifies the community, it unifies the community, and it brings happiness to the kids in the community. What do you think the arts provide to kids, especially those in low-income communities? I think it’s extremely important. Creativity and imagination are being lost, especially because of social media and technology. When we limit the arts, all kinds of arts, we’re limiting their creativity. We’re shutting down that function, that gift of creating and letting them express themselves. You see a lot of kids copying other artists. If we lose art we’re going to lose so much from kids. It allows people to express themselves in a way that nothing can.